The original version of this recipe appeared here. I was trying to make it “allergy friendly” for a party I was going to where the only guaranteed “allergy free” item conceivable was purified air! So this isn’t perfect, but I was making it for one specific person. Oh and I made a few other changes as well. Line a 9×13 pan with parchment paper, and sprinkle toasted almonds across the bottom. In a medium sized saucepan, melt together almond butter, honey and coconut oil. Remove from heat and add oats, chocolate chips and dried cherries. Stir until combined and chocolate chips are melted. Pour carefully into pan, over almonds. Refrigerate until hardened, about an hour. Store in refrigerator. Cut into squares, rectangles, or whatever other shape suits your fancy. These will get very melty after they have been out of the fridge for a while, so be prepared to pop them back in at a moment’s notice. They will get all over your fingers while eating. Guaranteed. Which is why I don’t have any pictures to share. They were either being scarfed down, or they were chilling back in the fridge. 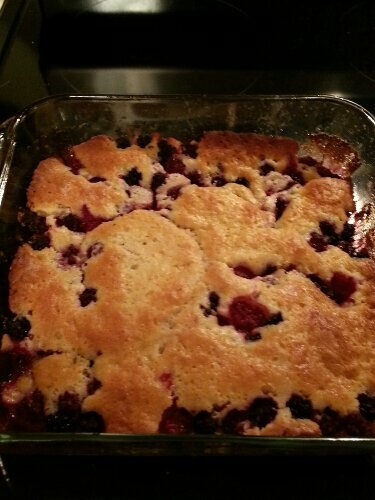 Categories: Cooking | Tags: dessert, Recipes | Permalink.